Ian Mikado MP outlines the attempts by some members of the Parliamentary Select Committee investigation into the sinking of the Belgrano to actually find out what happened. The main conclusion of our minority report was we called for another inquiry. For a high level inquiry, perhaps on Privy Council terms, to discover what we had been unable to uncover. And we have been unable to uncover many things. In some cases because the majority of the Select Committee refused to ask some questions, that ought to have been asked. In other cases, either because the government refused to answer some of the questions they were asked, or because they answered those questions at best misleadingly and at worst untruthfully. In Section 9 of the Minority Report we listed 30 such questions. Until those questions are answered, and one day they will be, the full truth about the Falklands War will be hidden from the people of Britain and from the world. Section 7 of our Report set out the seven major lies which the government told the House of Commons and the nation. I quote shortly four passages to indicate the width and depth of the deception. But the basic deception … the basic deception from which all the rest flows … the basic deception which we did manage to uncover, in spite of deliberate Ministerial obstruction … the basic deception is that a week before the critical Belgrano weekend, the government decided to make a radical change in their announced Falklands Policy, and decided at the same time to deceive the House and the Country by not announcing the change, and by pretending that they were continuing the original stated policy. That original stated policy was to use the minimum force necessary to secure a diplomatic solution to the conflict. During the weekend of 23rd 24th April the War Cabinet decided to abandon that policy and they decided instead to carry out an act of aggression sufficiently large and dramatic to prepicipate and escalate military action to the level that they could impose a solution by force. The large and dramatic act which they chose was to sink the aircraft carrier ‘Vente Cinco del Mayo’ (?) which they could reasonably claim was a potential source of danger to our forces. So they searched the seas for the aircraft carrier, but even with all the American satellites and GCHQ and all the rest of it, they failed to find the aircraft carrier. But they had to have some target, so instead they sank the Belgrano, which they knew perfectly well was not a potential source of danger to our forces. 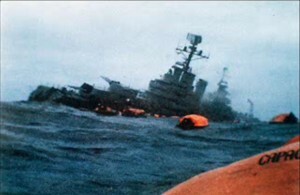 The question “Why did we sink the Belgrano” has been asked many times and has had many different answers but it is clear from our researches that the sure and absolutely factual answer to the question “Why did we sink the Belgrano” is We sank the Belgrano because we could not find the Vene Cino Del Mayo. The visit of Francis Pym to Washington and New York over the weekend of the 1st and 2nd of May was part of the pretence that the government was still seeking a diplomatic solution. Mind you, he himself, Francis himself, was not a party to the deception, indeed he was one of the victims of it . He was sent off, an innocent abroad, to talk peace with Al Haig and Peres Dequella, without being told that any such talk would be scuppered while he was engaged in it, by the decision to sink on of the Argentines capital ships. We got to know about this because in the last meeting with the United States Secretary of State, he asked … he sounded out what would be Her Majesties Governments reaction to a proposal for a further cease fire of a few days in order to seek further negotiations and a solution by diplomatic means. The answer he got was that the Government would not do anything that limited it’s military options. Mikardo didn’t actually proffer any meaningful evidence showing this, and frankly, it makes no sense in the context of what was actually happening (i.e., the liberation of the Falklands was already in progress – South Georgia had already been retaken, the Falklands had already been bombed, a submarine already sunk). You mean the carrier that, as Admiral Molina Pico has indicated, was at that moment sailing to attack the task force as part of a pincer move with the Belgrano? The reason why the Belgrano was sunk was because it was an enemy warship sailing in a war zone, on (as Hector Bonzo admitted) a mission of war. That’s it. The rest is just an attempt to smear Thatcher for something she did not actually do. But hey, if we’re throwing around groundless smears, how about the accusations that Ian Mikardo himself was a KGB spy? Whilst it is unfair to condemn someone on evidence so flimsy, you might be tempted to given how he did condemned others on equally insubstantial evidence.